Historical Marker #2281 commemorates the life and legacy of Ephraim McDowell, the "father of abdominal surgery." A native of Rockbridge County, Virginia, Ephraim McDowell moved to Danville, Kentucky, when he was a child. His father, Samuel McDowell, was a Revolutionary War veteran, an important judge, and presided over Kentucky's early constitutional conventions. Ephraim studied medicine in Virginia and Scotland before returning to Danville around 1795, where he opened a medical practice. Because of his skill and training, his reputation as an excellent doctor quickly grew. In 1809, McDowell was called to the Green County home of Jane Todd Crawford, who was thought to be pregnant and overdue. After diagnosing a growing ovarian tumor, McDowell knew her only hope for survival was an operation, which would likely prove to be fatal. Willing to risk the surgery, Crawford rode sixty miles on horseback to McDowell's office in downtown Danville. On December 25, 1809, McDowell removed a twenty-two-pound ovarian cyst from Crawford. Without anesthesia, she sang hymns throughout the procedure. The operation--which was then thought to be impossible--was a success, and Crawford lived another thirty-two years. Today, McDowell is credited with performing the world's first successful abdominal operation. In 1802, McDowell married Sarah Hart Shelby, the oldest daughter of Kentucky Governor Isaac Shelby. They had nine children, five of whom lived to adulthood. McDowell died in 1830 of an ailment thought to be appendicitis. McDowell was originally buried at the Shelby family estate, Traveller's Rest, located south of Danville. In the late nineteenth century, his remains were moved to McDowell Park, located between Centre College and First Presbyterian Church. Today, his home in downtown Danville is a museum. Statues of McDowell grace the Kentucky State Capitol rotunda and Statuary Hall in the U.S. Capitol in Washington, D.C.
Dr. Ephraim McDowell House. Danville, KY.: Photograph of Dr. Ephraim McDowell House, 125 South Second Street, Danville, KY. ca. 1940. Image courtesy of the Library of Congress. 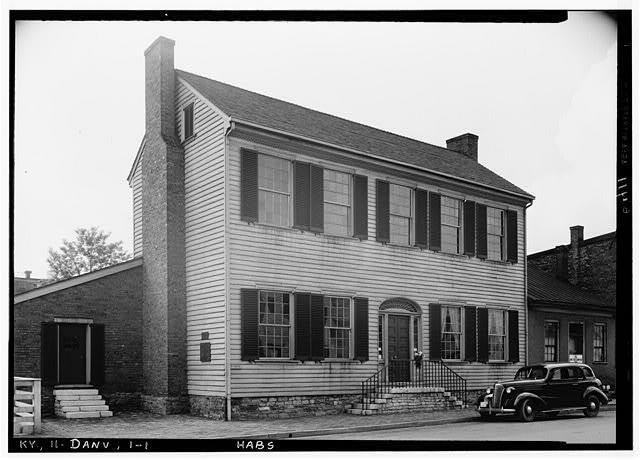 Ephraim McDowell House, “Ephraim McDowell, 1771-1830,” ExploreKYHistory, accessed April 22, 2019, https://explorekyhistory.ky.gov/items/show/109.